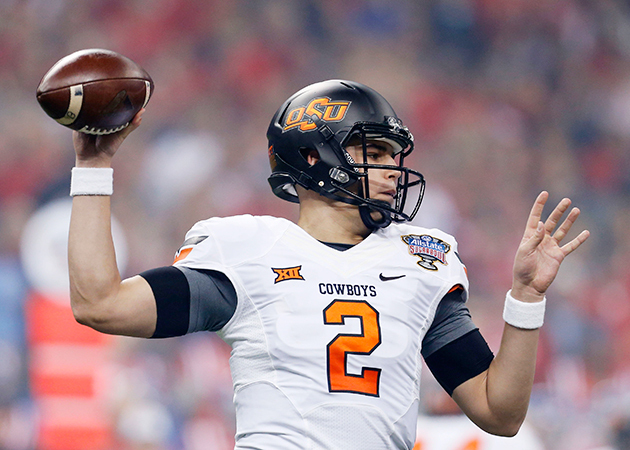 What did each Big 12 team learn in 2015? What did every Big 12 team learn in 2015? It’s been a little more than a month since Alabama celebrated its latest national championship inside University of Phoenix Stadium in Glendale, Ariz., but that doesn’t mean it’s too soon to review the 2015 season. For the Crimson Tide, it was mostly smooth sailing, but other teams endured plenty of turbulence. Over the next week, SI.com will lay out the biggest lessons learned by each squad from the Power 5 conferences and explain how those lessons can be instructive for 2016. We began with the ACC on Monday and now turn to the Big 12. Baylor’s three late losses that derailed what once appeared to be a season potentially bound for the College Football Playoff all came in vastly different circumstances. The Bears were simply bested by Oklahoma, lost a double-overtime heartbreaker to TCU in relentless rain and fell to Texas when their string of quarterback injuries eventually proved too much to withstand. The constant in all three losses? A negative turnover margin. Baylor lost the turnover battle to the Sooners by two, to the Horned Frogs by three (including four fumbles) and to the Longhorns by four. Giveaways were a consistent issue for the Bears; despite ranking 16th in the country with 2.0 takeaways per game, they still barely managed a positive turnover margin. Consistency under center should help with quarterbacks Seth Russell and Jarrett Stidham both returning from injuries. But with a 2016 schedule that again leaves Baylor with no margin for error to make the playoff, one game of sloppy ball control can derail the season. Iowa State: The skill positions look great, but what about the rest? New Cyclones coach Matt Campbell has already made significant progress in the most vital aspect to improving Iowa State’s stature. To consistently win, the Cyclones must upgrade their talent, which Campbell took the first step toward accomplishing by bringing in Iowa State’s first recruiting class ranked higher than 50th in the history Scout.com’s recruiting rankings. But the dividends from that class likely won’t arrive until a few years from now, so Campbell must work with what he has to try to get the Cyclones back to a bowl game. Luckily quarterback Joel Lanning, running back Mike Warren and wide receiver Allen Lazard give the offense three stars to build around. But an offensive line that loses all but one starter (left tackle Jake Campos) threatens to undermine that talent. It’ll be up to JUCO transfers Oge Udeogu and Karson Green to help to help create time and room for Iowa State’s prized players to operate. As arguably the worst Power 5 team in the country, Kansas may find the search for positives in its winless 2015 season to be tough. But with a young, depleted roster that forced new head coach David Beaty to use 33 first-time starters, how much could have realistically been expected? Beaty arrived in Lawrence with a strong track record as a recruiter, but it’ll take some signs of on-field progress to help his pitch to recruits. That progress will only occur if the coach can mold his players to be better than the sum of their parts. Kansas’s ‘15 season was defined by turnover, but the Jayhawks should be more experienced in ’16—that includes Beaty, who came to Kansas after coaching wide receivers at Texas A&M. Can that veteran knowledge lead to improved execution? Kansas State bring back loads of playmakers in its defensive front seven. Its top two tacklers (Elijah Lee and Charmeachealle Moore) return as do elite defensive linemen Will Geary and Jordan Willis (22 tackles for loss, 13 sacks combined). That should help the Wildcats improve a run defense that allowed 4.6 yards per carry in ‘15. Unfortunately Kansas State’s quarterback situation could negate the impact of the defensive improvement. Neither Joe Hubener nor Kody Cook force opposing defenses to respect the passing game, but perhaps Alex Delton or Jesse Ertz will earn the starting job and bring some balance to an offense that ranked 112th in yards per play last season. Mike Leach introduced the Big 12 to the Air Raid as Oklahoma’s offensive coordinator under first-year head coach Bob Stoops in 1999. Sixteen years later, Stoops returned to the well, needing a spark to jumpstart a program that appeared to be in a rut. After a playoff appearance and a Big 12 Offensive Player of the Year Award for quarterback Baker Mayfield, it’s safe to say the move was a success. And while Leach only hung around for a season before becoming Texas Tech’s head coach, offensive coordinator Lincoln Riley is back to partner with Mayfield again in ‘16. Oklahoma has some holes to fill on its offensive line and loses top receiver Sterling Shepard, but another year of familiarity in the system that helped the Sooners average 6.5 yards per play in 2015 should make the offense more potent. Rudolph played in just three games in 2014 but closed the season with a flourish, helping Oklahoma State beat Oklahoma in the Bedlam game and Washington in the Cactus Bowl. That finish increased the hype around the quarterback as he entered his sophomore season, but questions remained given the small sample size. Now that Rudolph has put together an exemplary season in ‘15, completing 62.3% of his passes for 3,770 yards with 21 touchdowns and nine interceptions, those questions have vanished. It takes a prolific quarterback to compete for a Big 12 title, and the Cowboys can feel confident that they have that box checked with Rudolph guiding the offense. TCU fans may always wonder what could have been in ‘15 had the Horned Frogs not been decimated by injuries. Throughout the season, TCU had to deal with injuries to nearly its entire receiving corps, entire defensive line and significant chunks of its linebackers and secondary, not to mention star quarterback Trevone Boykin’s ankle injury that forced him to miss the Horned Frogs’ 30–29 loss to Oklahoma. After remarkable injury luck helped TCU make a stunning leap in ’14, the law of averages kicked in. The Horned Frogs withstood the onslaught for most of the season, and made it to November without a loss. But as the meat of the schedule arrived, those setbacks proved too much to bear. The good news for TCU is it’s unlikely to be this unlucky again in ‘16, and the rash of injuries should create solid depth. The frustration with the beginning of the Charlie Strong era in understandable. No coach has lost as many games in his first two seasons as the Longhorns’ head coach as Strong has since Dana Bible went 3-14-1 in 1937–38. But consider what Strong inherited: No Texas player was drafted 2014, the spring before Strong’s first season. Five were drafted in ’15, but now only one player was among the 332 invited to this year’s NFL Combine. That’s fewer than 69 other programs, including 11 non-Power 5 teams and five FCS teams. Fortunately for Texas, thanks in part to Texas A&M’s recent downturn, Strong has still been able to recruit well despite the lack of on-field success. His 2016 class ranked eighth in the country after last year’s ranked seventh, according to Scout.com. Strong has restocked the program with the type of talent that anchored Texas’s best teams under Mack Brown. Now it’s time for the Longhorns to win like those teams. Texas Tech’s ‘15 campaign went about exactly as it should have. The Red Raiders beat the teams they should have beaten and lost to the teams they should have lost to. (You could quibble about the West Virginia loss, but winning in Morgantown is tough.) With quarterback Patrick Mahomes back after passing for 4,635 yards and 36 touchdowns, 7–6 feels like the floor for Texas Tech in ’16. But it might also be the ceiling. The Red Raiders ranked third in offensive S&P+, so there’s not much room for improvement on that side of the ball. But they were 121st in defensive S&P+. Head coach Kliff Kingsbury and defensive coordinator David Gibbs fired three assistants from the defensive staff after the regular season. Texas Tech can’t make further progress without development on defense. Luckily there’s nowhere to go but up. The regular season-ending loss at Kansas State muddled a season that would have otherwise clearly put the Mountaineers at the top of the Big 12’s second tier. Before falling to the Wildcats, West Virginia had lost to the four teams who entered November in contention for a conference title and beaten everyone else. The Mountaineers might have even had their own title hopes had they not had the misfortune of timing their most complete team of Dana Holgorsen’s tenure with their toughest conference schedule. West Virginia had to travel to Oklahoma, Baylor and TCU; it nearly pulled the upset in its one home game against a top-tier team, taking Oklahoma State to overtime. So where does that leave the Mountaineers heading into ‘16? Their Cactus Bowl win over Arizona State cooled Holgorsen’s seat a bit, and the offense should be in good shape if quarterback Skyler Howard can build on his breakthrough performance against the Sun Devils.